Newcomb, NY Leande Goulet 88, passed away peacefully July 20, 2018 at the Wesley Health Care Center in Saratoga Springs, NY. Leandre was born February 20, 1930 in Courcelles Quebec, Canada the son of the late Odilon and Angeline (Gagne) Goulet. He was a loving husband, father, and grandfather. He is survived by his loving wife of 61 years Mariette (Lapointe) Goulet of Newcomb; his son Gerald Goulet of Westport, NY; two daughters Linda Amado and her husband, Mitchell, of Saratoga Springs, NY and their children Anthony and Michele; and Mona McAuliffe and her husband, Robert, of Massillon, OH and their children Joseph and Brian. Eight sisters, Therese Belanger, Collette Belanger both of Canada, Louisette Gagnon of Maine, Lorraine Tardif, Rachel Cameron both of Canada, Marcelle Patry of New Hampshire, Nicole Janssen and Raymonde Jalbert both of Canada along with many nieces and nephews. He was predeceased by two brothers Denis Goulet and Benoit Goulet and two sisters Normande Richard and Candide Racine. Leandre worked as a self employed logger for over 50 years and served most of those years with Finch Paper LLC in Glens Falls, NY. He was a 4th Degree Member of the Knights of Columbus in Tupper Lake, NY. 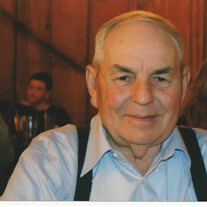 He was an active member of the St. Therese Catholic Church for over 50 years. A Mass of Christian Burial will be offered Monday morning July 23, 2018 at 11:00 AM at St. Therese Catholic Church in Newcomb, NY. Interment will follow in St. Therese Cemetery, Newcomb. Family and friends may visit the family from 3:00 to 5:00 PM on Sunday July 22, 2018 at The Edward L. Kelly Funeral Home 1019 US Rt. 9 in Schroon Lake,NY and from 10:00 AM until the mass on Monday July 23, 2018 at St. Therese Catholic Church in Newcomb. In lieu of flowers, expressions of sympathy may take the form of donations in Leandre's memory to the Newcomb Volunteer Fire Department, Newcomb Volunteer Rescue Squad, or the Newcomb Lions Club.